The Great Northern seeks to highlight Minnesota’s vibrant, pro-winter culture through original programing and local legacy festivals. 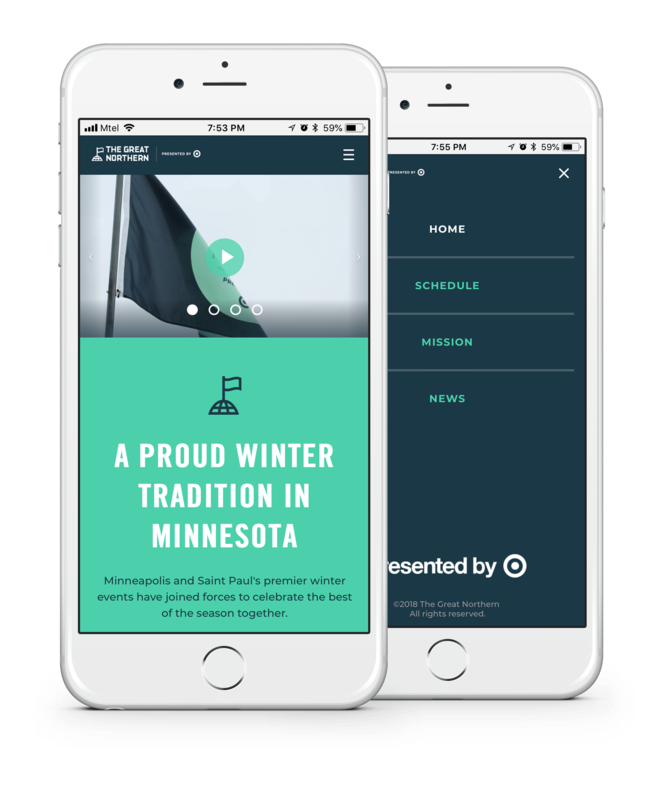 With an extensive roster of activities taking place across the Twin Cities over ten days, the organization needed to make it easy for people to access event-related information before, during, and after the festival. As a young organization with an ambitious growth strategy, The Great Northern wanted a digital platform that flexes with its needs over time, capturing its audience’s attention along the way through a polished and accessible user interface. Each event has its own set of text and images, in addition to various descriptive parameters (event date, type, location). The final product needed to balanced and present all of this information seamlessly. With a tight deadline, The Great Northern couldn’t waste time building unnecessary features. By aligning all project participants through the Agile methodology, our remote and local teams helped to focus the organization’s technological needs and align them with its strategic vision. Frequent communication enabled a high degree of adaptability and the team reached consensus faster when pivots were necessary. With clear feedback channels between project participants, MentorMate could translate critical information from stakeholders into a logical sitemap. By applying a measured approach to the solution’s information architecture in a responsive web application, we could ensure that users accessing content from a wide array of devices could always expect a cohesive and impactful experience. As much as the solution serves users seeking information on scheduled events, it’s also designed for the needs of those organizing and promoting events. Built on Firebase, administrators benefit from a content management system that supports a high degree of customization and control. Administrators can collect and schedule specific content that displays before, during, or after the festival’s run. 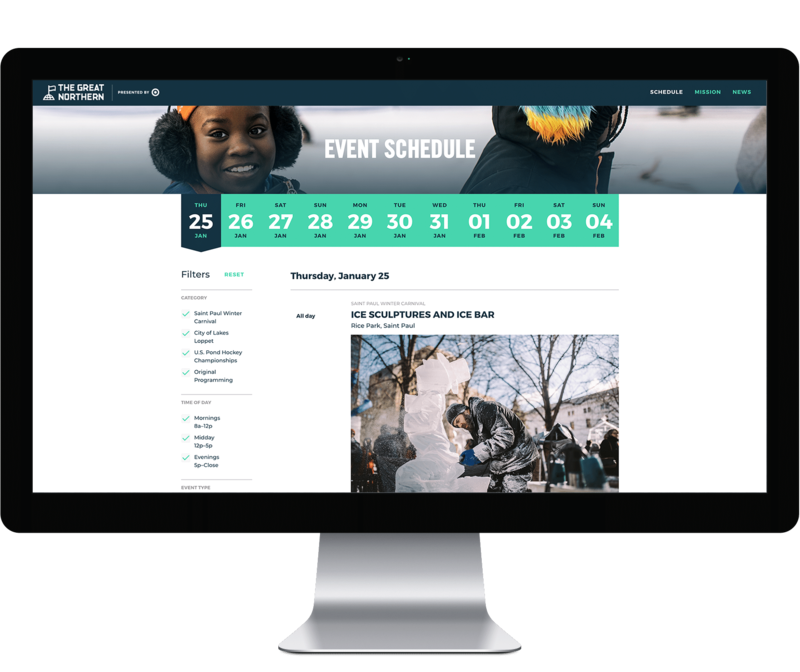 This way event organizers ensure The Great Northern’s digital presence remains fresh and engaging, even after the snow has melted. The Great Northern earned 32,000 page views on its former website over the course of 2017. In January and February 2018 alone, the new website sustained 52,000 page views. In the period after the event, stakeholders shifted the website’s focus to sharing photos, videos, and other social media content that highlights the community’s positive reaction to the festival. As next year’s festival approaches, the solution will once again transition to preview the events planned for 2019. Given the momentum achieved in its first two years, The Great Northern has big plans for the experiences it wishes to promote during future festivals. As its mission, event offerings, and audience continue to grow and evolve, The Great Northern has the polished and flexible platform that can reliably support its mission.